We’d love your help. Let us know what’s wrong with this preview of In Too Deep by Samantha Hayes. Even if he were still alive, your husband can't save you now. Did anyone get the ending? Well, it was a 4 solid Star if it wasn’t for the last page! First of all, I love the cover! It’s really gorgeous! Second, When I started this book, I thought yeah I know what’s happening but after each chapter I realized that something’s wrong and my guess definitely is not true. So it was really unpredictable for me. Another thing that I loved about this book was how the author ended each chapter, in such a way that your jaw dropped and you wanted to start the next chapter ASAP (albeit the story was a little slow at first chapters but then it was well-paced). But this was not good for the ending! Because it ended and I don’t know what’s going to happen next!! The mystery was solved but it somehow had an open ending (and I hate this in my books)!! When it comes to good, tautly plotted and beautifully written psychological thrillers Samantha Hayes is my go to writer – she has a clever and twisted mind (in the best way possible) a sharp and intuitive eye towards character building and a tendency to have me reading throughout the night. A family hit by tragedy then whilst trying to put themselve When it comes to good, tautly plotted and beautifully written psychological thrillers Samantha Hayes is my go to writer – she has a clever and twisted mind (in the best way possible) a sharp and intuitive eye towards character building and a tendency to have me reading throughout the night. In Too Deep will lead you down several garden paths until you finally find the gate – in that way it is classic storytelling within this genre The twists, turns and reveal moments are placed to perfection, you think you know one thing then find its another, believe you understand a character then realise you did not know them at all. I like the depth that Samantha Hayes brings to all the varying strands of this story (and her others for that matter) then always always manages to throw an unexpected and thought provoking finale onto things. Overall a really great read. A lot of fun for the mystery solvers amongst us, it will test your mettle and as ever a proper page turner. Samantha Hayes, an English author, has penned a gripping psychological thriller in her new book, In Too Deep that narrates the story of a woman and her daughter, whose husband and father goes missing one fine day and things start to fall apart months after the disappearance, and soon deadly secrets come knocking at their doorstep that can destroy the lives of two women. The compelling new psychological suspense novel, from the author of Until You're Mine, Before You Die and You Belong to Me. Perfect for fans of S J Watson and Sophie Hannah. After Rick's disappearance, Gina receives a phone call from a mysterious woman named Susan who is calling to confirm a hotel booking made by his missing husband for their wedding anniversary weekend. Eventually Gina decides to make that trip with her teenage daughter, Hannah, who has apparently gone crazy with all her mood swings, but little did Gina knew that Hannah has some dark secrets and that she would bring her baggage of dark secrets that can destroy lives, also the hotelier family seems mysterious with each passing day. The author's writing style is fantastic and the readers will be immediately pulled into the depth of the story right after the turn of very first page. Although the story builds up at a snail's pace, but gradually the story picks up momentum and in no time, the readers will be introduced to one twist after another, without giving a second to react. The narrative is highly absorbing, although the protagonists are bit reckless. The author has penned the story with through descriptions that will let the readers get a clear depth of the whole story line. The mystery is multi-dimensional and is concocted real tightly with unforeseeable twists and turns. The author unwraps the mystery one layer after another, thereby making the reader anticipate the story till the very last page and also keeping them glued to every page of this book. The edgy suspense and raw tension will definitely make the readers turns the pages of this book frantically. The characters from this book are very much well-developed, as the main characters reflect realism through their demeanor. Their flawed yet complex mindset will grip the readers minds psychologically thus leaving an imprint long after the end of the story. both Gina and Hannah are so twisted and so much wrapped up in their own worlds, that they did not find any time or resolution to face the challenges with a brave face. The darkness that underlies a human soul is very well captured by this author that the authenticity will strike the readers till the very end. All the other characters are also very well etched out and properly projected into the story line. In a nutshell, this is a compelling, riveting and extremely dark family thriller that will not let the readers to look away from the story line even for once. Verdict: A must read psycho-thriller. Courtesy: Thanks to the author, Samantha Hayes' publishers for giving me an opportunity to read and review this book. I have been a fan of Samantha Hayes for some time now so when I got my hands on this read I was torn between racing through it and savouring it and I did the latter and thoroughly loved it. It is the story of Gina and her daughter Hannah. Four months ago, Gina’s husband Rick nipped out to the shops and never came back. Nobody knows what happened to him. It is the kind of scenario that you read about in magazines and maybe even sometimes joke about in a “OMG there are times when I could just go t I have been a fan of Samantha Hayes for some time now so when I got my hands on this read I was torn between racing through it and savouring it and I did the latter and thoroughly loved it. It is the story of Gina and her daughter Hannah. Four months ago, Gina’s husband Rick nipped out to the shops and never came back. Nobody knows what happened to him. It is the kind of scenario that you read about in magazines and maybe even sometimes joke about in a “OMG there are times when I could just go to the shop and never come back …” way but the reality for Gina and Hannah is no laughing matter. I don’t want to give away anything more about the storyline because it would be oh so easy to give spoilers away for this tightly written complexly plotted story. If you have already read any of the author’s previous works you will know that she is not afraid to produce a story that is audacious in its plotline. If you want a subtle plot – then this may not be the read for you. This book is no exception, as you soon come to realise when you start to put two and two together, sorting out all those little hints that are dropped into the read into a scenario that I did work out for myself. However, I suspect that I was supposed to, because the joy of the read in this case is waiting to see if you are correct. It is extremely readable and oozes tension and suspicion on nearly every page. You feel like shouting out at the characters not to trust anyone. If you read and loved Until You’re Mine, you will be well aware of that absolutely stunning last line which just left you with your jaw hanging and in this read Samantha Hayes has done it again. She produced an ending that was satisfying in most respects but left me desperate for just one more chapter! I received a review copy from the publisher for Netgalley. I've been a fan of Samantha Hayes books for a while and was really excited to see this latest offering. So, here would be a good time to give out thanks to the author, publisher and NetGalley for the ARC received. The book focuses on a tragedy beset by Gina and her daughter, Hannah. Their husband and father, Rick, went out one morning to the local shops and never came back. The aftermath being the tortuous journey of what these two women go on as they struggle to come to terms with how a loved on I've been a fan of Samantha Hayes books for a while and was really excited to see this latest offering. So, here would be a good time to give out thanks to the author, publisher and NetGalley for the ARC received. The book focuses on a tragedy beset by Gina and her daughter, Hannah. Their husband and father, Rick, went out one morning to the local shops and never came back. The aftermath being the tortuous journey of what these two women go on as they struggle to come to terms with how a loved one can simply vanish into thin air. If you've ever read any of Ms Hayes books you will know that all is never as it would appear and this book is no different. We come to expect a tightly woven plotted thriller that will lead you down many different roads and send your imagination spinning as you try to work out just what is going on. I enjoyed this one on the whole, perhaps not as much as previous works but it's a good read nevertheless. Yes, at times it could be said it was a little over the top and in fairness I did see some of the outcome before it was revealed but I liked how suspicion was placed at every corner, round every bend as you move along doubting everyone bar the family dog! No author gets my brain working more than Samantha Hayes! I really do get excited when I hear she has a new book coming out as she never fails to surprise me. As most of you know I am Mrs "smug I worked the plot out early" but I am always totally misdirected by the twists and turn of Ms Hayes intelligent and suspenseful storylines. I read this in a day, there was absolutely no way I was leaving it until I got to that final jaw dropping page. How much hurt can one family take and still function? W No author gets my brain working more than Samantha Hayes! I really do get excited when I hear she has a new book coming out as she never fails to surprise me. As most of you know I am Mrs "smug I worked the plot out early" but I am always totally misdirected by the twists and turn of Ms Hayes intelligent and suspenseful storylines. I read this in a day, there was absolutely no way I was leaving it until I got to that final jaw dropping page. How much hurt can one family take and still function? We find out pretty quickly that Gina and her daughter Hannah are a family on the edge. Gina's husband Rick has disappeared, vanished while out doing that everyday task of buying a newspaper. This is the second tragedy to hit the family after the death of Jacob, their son, in a hit and run accident. Gina is continuing her life as best she can with her job in an estate agents and Hannah, her daughter, is at university struggling with problems of her own. It's been months with no news but one day a phone call gives Gina some small hope, a sign, that maybe Rick is trying to tell her something. But will Gina and Hannah put themselves in danger following this clue? Is this family of 2 about to become even smaller? The opening scenes of this book dragged you into the plot kicking and screaming! What just happened? Who is the mysterious woman chasing a man demanding answers then watching him die? We certainly want to find out more! I follow a missing persons charity on Twitter and I know that everyday it reports people, normal people living a normal life, just go missing. No clues, they just go out the door, off to do their usual daily routine...and disappear, sometimes never to be seen again. This is what happens to Rick. At least when her son died Gina had some closure, she was able to say goodbye to Jacob and have a funeral but here she is left in limbo. Did Rick walk out due to not being able to cope with the families grief? Or was there a more sinister reason for him not being in contact for over 4 months? The police have wound up their investigation as, with no foul play proved, they have no reason to keep searching. But Gina does and when a phone call leads her to a beautiful country hotel, she very quickly spots the clues to something being very wrong indeed. This is a slow burner of a book that gradually builds up all the clues (and too many red herrings to mention!!!) until your head is pounding. The final quarter of the book bursts into life when everything comes together and we are mentally screaming at Gina to see what's in front of her eyes! I thought I had everything sussed but was misdirected again but the twists and turns of the meticulous plotting of this book. A great psychological thriller that I thoroughly enjoyed from start to finish and recommend to anyone wanting to give their brain a good workout! Twists, Turns, Gripping, Tense, Deep, Engrossing, Edge Of My Seat! A Brilliant Read! I Loved It! Thank you to #TBConFB for the review copy! Desperate to find out more about his disappearance, Gina and her daughter take the trip. But there is something very strange about the hotel and the family tha Thank you to #TBConFB for the review copy! Desperate to find out more about his disappearance, Gina and her daughter take the trip. But there is something very strange about the hotel and the family that run it. Another brilliant page turner from Samantha Hayes. Her unique style of writing keeps you turning the pages - urgent to discover more. The only problem I had with this great book is the length of time it took to build up any pace. The last 3rd, in my opinion, is where it explodes, revealing the shocking ending. I always cherish a new book from Samantha Hayes, and this certainly didn't fail to keep my attention. I love the cover of this book, and the tag line "Your son is dead, your husband is missing and your in too deep" this works as it ties in with the title of the book. Gina's husband goes to the shop to buy a newspaper but never returns. This is told in two different points of view, which I always enjoy in a book as it lets you get involved with each character. I think it would of been good to add in the hotel owner Susan's point of view later on in the book. I did suss the main part of the story o I love the cover of this book, and the tag line "Your son is dead, your husband is missing and your in too deep" this works as it ties in with the title of the book. Gina's husband goes to the shop to buy a newspaper but never returns. I did suss the main part of the story out which was disappointing, and the ending was a bit up in air. Overall it was a nice read. I read the majority of this book during a 4 hour train journey and it certainly kept me engrossed (and I was especially disappointed when the train arrived in on time at the point of a massive cliffhanger!). To begin with, the story feels like a little of a slow-burner however it is Hayes fantastic writing style to build the tension and before you know it the twists and turns are happening and you start to doubt the things that you believe are fact! The first third of the book certainly kept my I read the majority of this book during a 4 hour train journey and it certainly kept me engrossed (and I was especially disappointed when the train arrived in on time at the point of a massive cliffhanger!). To begin with, the story feels like a little of a slow-burner however it is Hayes fantastic writing style to build the tension and before you know it the twists and turns are happening and you start to doubt the things that you believe are fact! The first third of the book certainly kept my interest but the next two thirds were fabulous due to the way the stories start to come together, I couldn't wait to find out more. As with all of Samantha Hayes' books I thoroughly enjoyed it! Read it all in 1 sitting as I couldn't put it down. A thriller about a missing husband and deep dark secrets embedded within the family. Plenty of twist and turns to keep you guessing and wanting more! Thank you to The Book Club and the publication company for sending me this ARC in return for a honest review! Very disappointed with this book having just finished another novel by Samantha Hayes that I really enjoyed. Boring plot that moved sooooo sloooowly. The characters were uninteresting and you figure out the plot less than halfway thru the book which just makes it an even more boring read to the finish line. And the ending!? I don't get the last page? Is there a sequal? Was it Susan after all? I'm confused! I was so disappointed with this book. I've read some really good stuff from this author, so my expectations were fairly high, but in many ways it was a bit of a turkey. It wasn't a one star book for the following reasons. Her writing craft is very good - text that flows, dialogue that seems real, and an ability at least to some extent to give a sense of place. Also, the character writing was real enough that I formed strong views about the main people. Unfortunately, my main conclusion is that th I was so disappointed with this book. I've read some really good stuff from this author, so my expectations were fairly high, but in many ways it was a bit of a turkey. It wasn't a one star book for the following reasons. Her writing craft is very good - text that flows, dialogue that seems real, and an ability at least to some extent to give a sense of place. Also, the character writing was real enough that I formed strong views about the main people. Unfortunately, my main conclusion is that they weren't that interesting. I don't need to like my characters but I do have to be intrigued by them, or something! I suppose what annoyed me most was that Gina is supposed to be a history graduate from Oxford, but there is not one sense in the entire book of her having any intellectual curiosity or knowledge or any of that confidence-bordering-arrogance one would expect from such a graduate. And the same for her daughter, albeit a first year student, but at a prestigious and competitive university. The book was very slow starting. I do see that the author was trying to create a sense of Gina & Hannah's life in the first half, in order to make an impact in the the second half. It's a valid technique but, if I hadn't already enjoyed several of the author's books I would have bailed out about halfway because of the sheer monotony. The rest of my review is a massive spoiler for the book (view spoiler)[It's a decent enough premise for a story, although, explaining it to my non-bookish OH, he immediately said it's been done before. In fiction, and, intriguingly, in life. And most people's immediate question was - how did he get away with it? That would have been the basis of a good story. Little hints that not everything was quite as it seemed. I guess most of us of can get away with a little fiction from time to time - for an evening, or hiding a purchase, but to get away with a complex double life for twenty years must require so much effort that the strain of remembering what you said to who, or where you went on holiday, details of the children's lives, and so on. Very few men - or indeed women - manage to order those details in a real, straightforward life; for a double life, it seems impossible. There are a lot of annoying questions that remain unanswered. The big one - when Rick's disappearance was in the papers, how did Phil operate in the world - didn't one person in the hotel think how much he resembled the missing man? Then, the pregnancies seemed a bit too convenient - intelligent educated women not using contraception? And Hannah not even contemplating an abortion despite the obvious difficulties? Ultimately, the story revolved around Rick/Phil, but we got conflicting impressions of his character. This was discussed by Gina and susan, but it was difficult to square the violent spiteful man who appeared at the end with Gina's loving husband. And, again, having killed his own son, it might have been interesting to get some sense of his behaviour and reactions afterwards, dealing with his wife and daughter's grief but having to wrestle with his own knowledge of guilt. This didn't resonate with me like the author's other books have done. It started out quite slowly, which is not unusual, but the Gina and Hannah characters were awfully whiny. Yes, I know they've had a hard time but this guilt trip/pity party stuff just annoys me at times. Why do people think their secrets are so much scarier than anybody else's? And surely at some point you have to realise that you just need to come clean, especially as the truth tends to come out eventually anyway, no matter h This didn't resonate with me like the author's other books have done. It started out quite slowly, which is not unusual, but the Gina and Hannah characters were awfully whiny. Yes, I know they've had a hard time but this guilt trip/pity party stuff just annoys me at times. Why do people think their secrets are so much scarier than anybody else's? And surely at some point you have to realise that you just need to come clean, especially as the truth tends to come out eventually anyway, no matter how hard you try and stop it. So Gina's husband Rick disappeared about 4 months before Gina convinces her daughter Hannah that they should still go and take advantage of a 5 day pamper package at a country retreat that Rick had organised for his and Gina's anniversary. They thought its maybe what Rick would have wanted (huh?). That's when things start to get a bit creepy. Well not really creepy but not real kosher either. Something is a bit off here. Susan, the owner/manager is also a bit off. Personally I would have just told her to mind her own business and buggered off out of there but of course that's not what our protagonists do. Things start to slowly unravel for everyone. It gets a bit better in the second half but I worked out pretty early what was going on so unfortunately whatever drama there might have been was totally wasted on me. I can’t believe this is the first book I’ve read by Samantha Hayes, but it’s safe to say it won’t be my last! In Too Deep is full of mystery and Intrigue and oh what a tangled web the author weaves. When the story begins it seems it’s going to be a “run of the mill husbands gone missing kind of book”, but it’s anything BUT! We are introduced to Gina whose husband is missing, she is struggling to find answers to his disappearance and cope with life in general “after Rick”. Hannah the daughter als I can’t believe this is the first book I’ve read by Samantha Hayes, but it’s safe to say it won’t be my last! In Too Deep is full of mystery and Intrigue and oh what a tangled web the author weaves. When the story begins it seems it’s going to be a “run of the mill husbands gone missing kind of book”, but it’s anything BUT! We are introduced to Gina whose husband is missing, she is struggling to find answers to his disappearance and cope with life in general “after Rick”. Hannah the daughter also is struggling to cope with life, after she finds out a secret that leaves her devastated. Told from the alternative perspectives of Gina And Hannah, you get a real feel for the characters, they are very well developed with plenty of depth. This is a family whose lives are built on lies and shows how bad things happen to the nicest people, you really begin to wonder how much more heartbreak Gina will have to cope with. As the plot unfolds I did wonder where it was going, as it took so many twist and turns along the way. I did manage to work out some of the answers by the halfway mark, but this in no way distracted from my enjoyment of the book. I have mixed feelings about this read. It took a while to warm up, to engage, to compel me to turn the page. Then I was only about one quarter my way through the book when I made some accurate yet hesitant connections regarding mysteries in the overarching storyline – the author however was clever enough to keep me doubting my assumptions, keep me reading. Then we have the ending…I didn’t get it. (No spoilers here) Yes the ending did wrap up the mysteries and the actions of one of the main characters was in keeping with some earlier events but just didn’t make sense to me. The action itself did not seem dramatic enough or that it would have any dire consequences. (Think about the location…) And it felt like the story abruptly ended, that there needed to be another chapter to discuss, make sense of this last piece of action. Well that is how it felt to me. Despite these potholes I was ultimately engaged in the narrative and kept reading till the book ended. I haven't read any of Samantha Hayes' previous books but I have heard about them and know they're well liked, so I was keen to read and review In Too Deep. The book started promisingly enough, but it continued to develop at such a slow pace that I got quite bored with it. The storyline itself is good and so I wanted to know what happened, which is why I didn't stop reading. And although I felt that it was well written I had worked most of it before the end. In Too Deep could have been a really r I haven't read any of Samantha Hayes' previous books but I have heard about them and know they're well liked, so I was keen to read and review In Too Deep. In Too Deep could have been a really really good book, and it has got many very positive reviews so maybe it just didn't click with me for some reason. I really liked the plot line but feel incredibly frustrated with the book, and especially the ending. I always enjoy Samantha Hayes' books and this one is no exception. She has a wonderful way of making the characters very real and engaging so you can't help but read on to find out more and just when you think you know what's happening, you're taken in a different direction. In Too Deep is another captivating read that did not take long to read as 'one more chapter' was never enough. I hope Samantha Hayes will carry on writing books like this one and I recommend it to all readers of psychologica I always enjoy Samantha Hayes' books and this one is no exception. She has a wonderful way of making the characters very real and engaging so you can't help but read on to find out more and just when you think you know what's happening, you're taken in a different direction. Firstly thank you to Tracy Fenton and TBC team for the opportunity to read and review this amazing book, wow I feel rung out now I'm finished, really enjoyed this book not my usual choice of reading genre but it certainly won't be my last, The story is told from the point of view of Gina and Hannah a mother and daughter, this I think gave more depth to the characters as you were feeling first hand how they felt, a rollercoaster ride of a story with an outstanding finale. I would will definitely b Firstly thank you to Tracy Fenton and TBC team for the opportunity to read and review this amazing book, wow I feel rung out now I'm finished, really enjoyed this book not my usual choice of reading genre but it certainly won't be my last, The story is told from the point of view of Gina and Hannah a mother and daughter, this I think gave more depth to the characters as you were feeling first hand how they felt, a rollercoaster ride of a story with an outstanding finale. What a great book and another winner from this wonderful author. Gina's husband Rick goes out to buy a newspaper and this small task will change Gina's life forever, Rick does not return. This sets off the story which has a superb plot, great characterisation and is one of those books you just want to keep reading until you find out what happens, of which I did in one afternoon. Full of tension, twists and clues that will definitely keep you totally engaged, highly recommended. I really liked how the author ended each chapter, leaving me wanting to turn pages! This was not 5 stars to me over just personal opinion/preferences! I sometimes read too much into stories and I do not want to give it away (for others who might like to read it) but I kept thinking how this was really pulled off! And that ending!!!! What did that mean???? In Too Deep opens with a heated argument, some questions and a bit of pulling and pushing between 2 characters. The unidentified male unfortunately is on the receiving end of a hit against his head. Queue to the present where Gina’s husband is missing for four months already. He went out to buy a newspaper and never returned. It doesn’t take much to make the link between these two events, now does it? The author does not keep his fate a secret, we are in the so-called loop while everybody else s In Too Deep opens with a heated argument, some questions and a bit of pulling and pushing between 2 characters. The unidentified male unfortunately is on the receiving end of a hit against his head. Queue to the present where Gina’s husband is missing for four months already. He went out to buy a newspaper and never returned. It doesn’t take much to make the link between these two events, now does it? The author does not keep his fate a secret, we are in the so-called loop while everybody else seems to be unaware of his fate. Yet the question remains who was the other person and why has this happened. It’s only when mother and daughter go on a spa weekend that was booked by Rick as an anniversary surprise that things start to unravel. There is a constant undercurrent of secrecy hanging in the air while they are staying there. Susan, the hotel owner appears friendly and sympathetic, taking a real interest in Gina and her daughter but there’s something about her which is still unsettling. Is she really being sincere? Is she taking too much of an interest and why on earth would she, their everyday lives and worlds are far apart and they don’t know each other? I could feel something going on but didn’t know how to puzzle all this together though for a long time and I had to wait until the author finally diffused this unrelenting simmering tension. Gina’s despair is so palpable and her emotions so rightfully worded. The author must have gone quite deep for this, perhaps even drawn from her own experience or from seeing someone close to her experience a loss to make it this heartfelt. Her guilt, her hopes, her questions are front and center in her everyday life. My heart ached for her and made me hope that she’d find an answer soon, before her drinking taking its inevitable toll. Gina’s turmoil is alternated with her daughter’s voice Hannah. People react differently to situations like this and she definitely has another way of approaching her father’s disappearance. She tries to put her emotions under a lid and goes out from the worst scenario. There is also something else going on in her life that worries her and seems to take up a lot of energy. She has some kind of secret, something that started with her picking up an abandoned phone lying under a dustbin and meeting the person who was the last called number. She feels her mother has enough to deal with and she can’t burden her with any more so she keeps it all to herself, although it weighs on her terribly. The beauty of the novel is revealing bit by bit the secrets her daughter keeps, switching between past events at uni where something caused her to experience some serious heartbreak and the present time where she’s not her old self anymore, and what happened to Gina’s husband. I admit that I did work out one thread of the plotline that concerned Hannah, but there were still some good surprises in the last 10 % of the novel. The writing is excellent, with so much feeling and she was able to sweep me along in this web of mystery effortlessly. The plotline was clever and was able to surprise me on some points but I still kind of would have liked it to have gone in another direction. A good psychological thriller that is sure to keep every reader guessing for the most part of the novel. This isn’t the first novel by Samantha Hayes that I read and it will definitely will not be the last. In Too Deep is one of those books that the reader is really loathe to put down, the urge to read 'just one more chapter' is there, all the way through. The story is fast-paced, unpredictable and leaves the reader reeling from the hurtling journey that this very clever author takes us on. Rick has been missing for four months. He left the house to walk to the corner shop and buy a newspaper. It was an ordinary morning, he didn't take his phone, or the dog, he wasn't going to be out long enough to even bother to get the dog's lead. But he didn't return. His wife Gina is struggling. The police investigation seems to have been scaled down, and despite their initial help and support, it's clear that the officers on the case can do very little more. Rick and Gina's daughter Hannah is also struggling, but she's keeping her innermost thoughts to herself. She hasn't shared any of her worries with her mother, how can she add to Gina's pain? On the surface, Rick and Gina were the perfect couple. They had endured the tragedy of losing their young son Jacob in a hit and run accident. The driver of the car who killed Jacob was never found, and their lives were ripped apart by their loss. Daughter Hannah returned unexpectedly from her first term at University just a couple of days before Rick disappeared. Unusually quiet, her parents assumed that a boy was involved and were determined not to interfere, she would talk when she wanted to. And then, suddenly, Gina and Hannah are the only ones left. When Gina finds out that Rick had arranged a surprise trip to a luxury hotel to celebrate their anniversary, she decides that she and Hannah will take the break together. Once at the hotel, things begin to take on a sinister note, and Samantha Hayes's skill in creating suspense and unease is at its very best. Gina and Hannah's characters are expanded, the reader learns more about the truth behind the brave faces, becoming privy to their innermost thoughts and fears. All the while, the reader can think about the explosive prologue to this story. We know that Rick was followed by a mystery woman on the morning that he disappeared and these few paragraphs at the beginning of the story add so much the telling of the story, but also completely mess with the mind as the reader. I really thought that I'd sussed this one very early in the story. How wrong can you be? Be prepared to expect the unexpected, be prepared to swear when you are taken down yet another path only for another twist to be exposed, turning the story completely upside down. You know you’re in a safe pair of hands with Samantha Hayes and I’m happy to say that her new book, In Too Deep, is no exception. Samantha has always said that her interests lie in portraying how crime can impact on normal families and In Too Deep does exactly that: it takes a normal family, puts them through hell and examines the devastating fallout. This means that however much the plot twists and turns unexpectedly, and however much remains a suspenseful secret right up until the end, the story develops realistically and at a steady pace, rather than in fits and starts due to far-fetched red herrings or artificial, manufactured race-against-time scenarios that turn out to have no bearing on the plot. Her stories grow organically and without the buckets of melodrama thrown in by lesser writers. 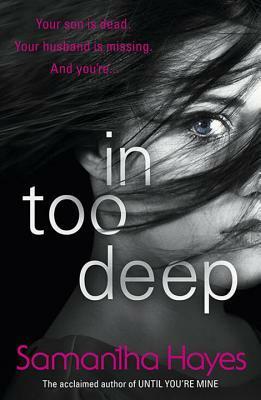 One of the reasons I liked In Too Deep was because it reminded me of the kind of engrossing domestic psychological suspense standalones that Nicci French used to write before abandoning this approach in favour of their more conventional crime series featuring the psychologist Frieda Klein. These great early books were often written from the perspective of the victim and In Too Deep is composed of the points of view of two confused “victims” – Gina Forrester and her daughter Hannah – and concerns the disappearance of Gina’s missing husband, Rick. The plot is expertly handled with clues peppered throughout at just the right points in the story and though the reader is kept in the dark for large portions of the story the suspense holds throughout. The characters of Gina and Hannah are also pitched just right: they are relatable, even though they are not without their faults, but not so unlikeable that you don’t care what happens to them. Samantha Hayes always writes realistic, complex characters that are never just 2-D heroes or villains. If I had any criticism of the book it’s that one of the characters seems to be holding on to a secret almost right from the beginning of the book and it’s a bit frustrating to have to wait so long to find out what it is! You just want to shout: “Come on, Samantha, give us another clue!” which, of course, makes you want to read on to find out what it is! And, of course, everything is finally revealed in a convincing and satisfying ending which I personally didn’t see coming till just before the reveal. Overall, this is another great domestic thriller from Samantha Hayes and if you’re already a fan of her work then you won’t be disappointed. This book was supplied by NetGalley in return for an honest review. Samantha Hayes heeft het weer voor elkaar!! In too deep is een echte pageturner. Na drie delen uit de Lorraine Fischer serie werdt het tijd voor een standalone boek. De kracht van Hayes is dat zij van een moelijke gezinssituatie een bloedstollende thriller kan maken. In too deep is hier een goed voorbeeld van. Het verhaal wordt verteld door de ogen van moeder Gina en dochter Hannah, samen moeten zij de dood van een familielid verwerken en de verdwijning van een ander lid van de familie. Een van Samantha Hayes heeft het weer voor elkaar!! In too deep is een echte pageturner. Na drie delen uit de Lorraine Fischer serie werdt het tijd voor een standalone boek. De kracht van Hayes is dat zij van een moelijke gezinssituatie een bloedstollende thriller kan maken. In too deep is hier een goed voorbeeld van. Het verhaal wordt verteld door de ogen van moeder Gina en dochter Hannah, samen moeten zij de dood van een familielid verwerken en de verdwijning van een ander lid van de familie. Een van deze dames heeft een groot geheim. Als moeder en dochter uitgenodigt worden voor een verblijf in een luxe hotel komen langzaam de puzzelstukjes samen. In too deep heeft mij van het begin tot het einde gegrepen. Ik werd als lezer gelijk meegesleurd in het verhaal van Hannah en Gina en zoals bij een goede thriller hoort veranderde ik zelf in een soort Sherlock Holmes, inclusief complottheorieen. Als lezer krijg je bij ieder vraag die je denkt te hebben beantwoord een nieuwe vraag. De conclusie komt dan ook uit een onverwachte hoek en laat je snakken naar meer. Samantha Hayes has done it again!! In too deep is a real page turner. After three parts in the Lorraine Fischer series, it was time for a standalone book. The power of Hayes is that she can turn the most difficult family situation into a blood boiling thriller. In too deep is the perfect example of her power. The story is told from the viewpoint of mother Gina and daughter Hannah, together they are dealing the the death of a family member and the disappearance of another. One of these ladies had a huge secret that will rock their world. When mother and daughter are invited to stay in a luxurious hotel, all the pieces fall into place. Thanks for stopping by my Goodreads page! I'm thrilled that my latest book THE REUNION is out NOW from all good online ebook retailers, as well as a paperback from Amazon. I do hope you love it! "They were all there the day Hello! "They were all there the day your sister went missing... Who is lying? Who is next? When another girl disappears, long-buried secrets begin to surface. One of the group hides the darkest secret of them all…"
UNTIL YOU'RE MINE is the first of three books in my series featuring married detectives DIs Lorraine Fisher and Adam Scott. It's available in the UK and USA as well as lots of other countries around the world. BEFORE YOU DIE is the second in the series, and YOU BELONG TO ME the third. IN TOO DEEP is a standalone story and all are creepy psychological thrillers with and available now. Oh, and don't forget to look out for the four thrillers I wrote under the name Sam Hayes - Blood Ties, Unspoken, Tell Tale, and Someone Else's Son.